Most of us don’t think about our greyhounds’ urinary tracts — until a problem arises (or descends, such as onto your antique Persian rug or on the side of Uncle Moe’s white linen sofa). But our dogs’ kidneys and lower urinary tracts can develop such problems as infection, obstruction, inflammation, autoimmune disease, stones or tumors. All of these can result from (or lead to) disease states of the renal and/or other organ systems. This article explains several commonly diagnosed problems of the kidneys and lower urinary tract (bladder and urethra), as well as discusses signs and symptoms, methods of diagnosis, and treatments currently available. Please remember, however, that this article is not intended to take the place of a veterinary evaluation. You should discuss any unusual changes in your dog’s health or urinary pattern with your veterinarian as soon as possible. These scenarios are suspicious for urinary tract infections. UTIs are broken into two categories: lower tract, and upper tract. Lower UTI’s may present with painful urination, incontinence, blood in urine, or a bad odor to the urine. Upper UTIs often present with increased water consumption and/or urine volume. In severe cases, the dog may show signs of renal failure: A greyhound, Tammy, was diagnosed with a UTI, and bloodwork indicated that her renal function tests (BUN and creatinine) were markedly elevated. She appeared to be in acute renal failure. Fortunately, after several days of antibiotics, her levels have returned to normal. UTIs are diagnosed by urinalysis, urine culture, and if upper tract infection is suspected, perhaps bloodwork, x-rays and/or renal ultrasound. Treatment is with antibiotics; most veterinarians will prescribe an antibiotic that will treat the most common bacteria responsible for UTIs, but a medication change may be indicated, depending upon the results of the urine culture. Causes of recurrent or complicated UTIs include: obstruction within the urinary tract (such as tumor, urethral strictures, or stones); anatomic defects; neurological causes, such as spinal cord injury; or urinary retention. Dog owners should be aware that one potential cause of UTIs is urine remaining in the bladder for an extended period of time. While most Greyhounds can handle an eight-hour wait and can even tolerate ten to twelve hours, prolonged time between voiding can cause the urine in the bladder to become stagnant, promoting bacterial growth. Be sure you allow your dog to empty its bladder at least three to four times a day. For some people, this may mean finding a friend, relative, or neighbor willing to come in the middle of the day to let the dog relieve itself. Urine Test Strips - anyone can buy these. A veterinarian should examine a reliably housebroken dog who suddenly exhibits urinary dribbling or incontinence to determine if a UTI is the underlying cause. However, spayed females may have “post-spay incontinence” — urinary dribbling or uncontrolled urination due to the lack of estrogen after spay. Once the veterinarian has ensured that no infection is present, two medications are available to control incontinence: Phenylpropanolamine (PPA) and Diethylstilbestrol (DES). For severe cases unresponsive to medication, surgical repair may be an option. Many substances form stones, such as urate, struvite or calcium oxylate. Symptoms of stones include UTIs, dysuria (painful urination), blood in the urine, incontinence, and urinary obstruction. Diagnosis is made by urinalysis, x-ray, cystography or ultrasound. The veterinarian should send any retrieved stones to a lab for analysis to determine the best means of preventing future recurrences. Treatment of stones includes surgical removal, as well as retrieval with a catheter. In addition, UTIs resulting from bladder stones need to be treated with antibiotics. Often, special diets will prevent stone re-formation. Dogs who form calcium oxylate or calcium phosphate stones should have a thorough medical evaluation to determine the underlying cause (such as an overactive parathyroid gland, which can lead to elevated serum calcium). 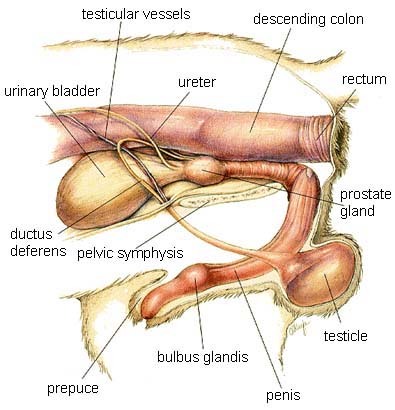 Prostatitis is inflammation and/or infection of the prostate gland (found only in males). While prostatitis can occur in neutered males, castration greatly reduces the risk of developing the disease. Signs and symptoms of prostatitis include: painful defecation, painful urination (dysuria) and possibly urethral discharge. Symptoms of Prostatitis are fever, depression, abdominal pain, stiff gait in the rear limbs, jaundice (yellow discoloration of eyes or pigment), elevated white blood cell count, or elevated liver enzymes. Prostatitis is diagnosed by examination of the prostate, urinalysis, CBC (complete blood count, which will indicate an elevated white blood cell count, if present), and blood chemistries. If a urethral discharge is present, it should be examined under the microscope. Other means of diagnosis include ultrasound, cystography (x-ray exam of the lower urinary tract with contrast dye injected) or biopsy. Prostatitis requires antibiotics for a minimum of four weeks, and castration may be indicated. Dogs having an enlarged but uninfected prostate (benign prostatic hypertrophy) may be treated with estrogen, but castration is generally recommended. Prostate cancer does occur in dogs as it does in humans. It may be treated with radiation therapy, or surgical excision of the prostate; the latter, however, may result in urinary incontinence. Acute Renal Failure (ARF) may be due to ingestion of a drug or other substance toxic to the kidneys, or to an event resulting in loss of blood supply to the kidneys. Other precipitants include: anesthesia, surgery, severe dehydration or shock, sepsis, congestive heart failure, liver disease, or the use of medications like ibuprofen (NSAIDs). ARF is diagnosed based upon urinalysis, blood tests measuring renal function (BUN and creatinine), measurement of urine output (which should be one to two ml/hr/kg body weight), or sudden-onset of glucose and/or protein in the urine. Treatment includes intravenous fluid therapy, careful monitoring of fluid input and output, monitoring of electrolytes, diuretics, nutritional support, and possibly dialysis. Signs and symptoms of CRF include depression, fatigue, weight loss, anorexia (loss of appetite), mouth sores and/or sloughing of the tongue, vomiting, diarrhea, or constipation. In addition, polyuria (large volume of urine), polydypsia (drinking large quantities of water) and nocturia (awakening to urinate at nighttime) are common. More symptoms are muscle weakness, seizures, pallor, bruising, bleeding from the GI tract, enlarged heart size, and dull coat. CRF is diagnosed by examination, urinalysis and blood tests. Your vet may note anemia, elevated potassium in the blood, protein in the urine, and hypertension. X-rays or ultrasound may show a decrease in kidney size. Management consists of a careful balance of electrolytes and other metabolic parameters, dietary regulation, subcutaneous fluids when indicated, sodium restriction, medications for hypertension, and possibly Lasix, a potent diuretic. Severe anemia may also require treatment. The above is the true story of a greyhound living in Virginia, who was adopted as a ten-year-old and, within weeks of his adoption, showed the signs mentioned above. He was diagnosed with Glomerulonephritis (G-N). G-N is generally considered an autoimmune disease, where the body perceives some of its own cells as foreign, resulting in antibody formation against kidney tissue. This may occur secondarily to infection such as in Ehrlichiosis or Rocky Mt. Spotted Fever. Other factors are tumor, inflammation (such as systemic lupus or pancreatitis), or other causes. Signs and symptoms of G-N may include signs of CRF, as well as swelling of the limbs, ascites (fluid in the abdomen), difficulty breathing, and protein in the urine. G-N is diagnosed by urinalysis after a twenty-four-hour urine collection for measurement of protein. Definitive diagnosis is by renal biopsy (usually performed with ultrasound guidance). Treatment includes steroids, aspirin, dietary modifications, ACE inhibitors for treatment of concurrent hypertension, and diuretics as needed. Underlying infection, if present, must also be treated. Certainly, G-N, as well as other kidney diseases, should “raise a red flag.” Be sure your veterinarian performs a tick panel to determine if your Greyhound has (and needs to be treated for) a tickborne disease. Renal tumors are usually rare, except as metastatic spread from other organs. They tend to occur twice as often in males as in females. Symptoms include anorexia, depression and weight loss. There may be blood in the urine. The vet may be able to palpate an abdominal mass. Bloodwork may show elevated renal functions or anemia. Diagnosis is by x-ray (and possibly intravenous pyelogram, which is a series of x-rays taken with IV contrast), ultrasound, and chest x-ray to detect any tumor spread to the lungs. Prognosis is guarded: there is a high rate of metastatic spread. Treatment is removal of the diseased kidney. Bladder tumors may also occur in canines. A major risk factor is obesity (yet another incentive for us to keep our dogs fit and trim)! Symptoms include incontinence, hematuria, dysuria, polydypsia and polyuria, and recurrent UTIs. Bladder tumors are diagnosed by cystography or ultrasound. Chest x-rays should also be taken to check for spread to lungs. Prognosis for bladder tumors is guarded as well; 50% of bladder tumors will metastasize. Treatment is surgery, radiation therapy, and possibly chemotherapy. 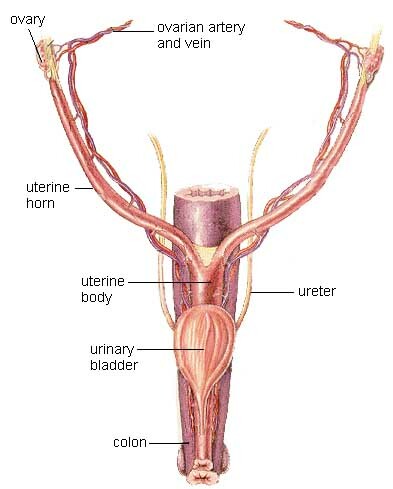 Urethritis can present with dysuria, symptoms similar to urinary tract infection, inability of the dog to void, and, in females, a thickened, irregular urethral wall. Urethritis may occur due to chronic UTI. Treatment may include antibiotics, prednisolone (steroid) or cyclophosphamide (Cytoxan, a chemotherapeutic drug). Kirk’s Current Veterinary Therapy XII, WB Saunders Company, 1995.